"She's seen your face. Do it. Do it for me. Do it and we can be safe." The foreboding sense offered by terrific horror films has sadly been lacking in recent years, thanks to the seemingly universal feeling that the louder and more grotesque the horror, the better. That sense of eeriness that was for so long a staple of the genre is an unmatchable cinematic force that sticks with you for hours after the credits roll. 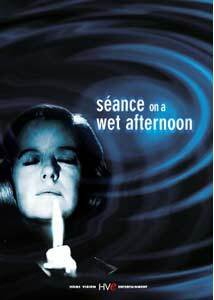 It had been a long time since I had felt it, until I watched the Bryan Forbes film, Seance on a Wet Afternoon. It is a film so steeped in atmosphere that, while not overly frightening, contains enough moments to chill you to the bone. Myra (Stanley) believes herself to be a psychic medium of terrific skills, which have heightened since the death of her son. Wishing to tell the world of her abilities, she crafts a plan with her meek husband, Billy (Attenborough), in which the couple will abduct the child of a wealthy family and hold her for ransom. To obtain the money and get away clean, Myra will use her "abilities" to locate the girl and prove herself to everyone. But things, of course, go horribly awry. To say more about the plot would spoil the intricacies and pleasure that come when viewing this film. Director Bryan Forbes does a skilled job of slowly building the tension by only allowing the viewer to learn bits of information as the film goes along. Instead of being treated to long-winded discussions about the scheme to kidnap the girl, Forbes wisely keeps the viewer on a very short leash. His use of this technique also allows the performances to blossom as we get caught up in the film, based on the mannerisms and unspoken moments that exist between Myra and Billy. Stanley received an Academy Award® nomination for her performance as Myra, and the honor was truly deserved. They way Stanley plays the part is unexpect; she crafts Myra as someone who is rather fragile and mentally imprisoned. Attenborough is right in line with Stanley; he creates a sympathetic character in Billy. There are scenes in which Billy clearly sees his wife's mental state slipping and yet he follows her because he knows of no other way to live. It is in these very strong performances, as well as the gifted direction, that Seance on a Wet Afternoon exceeds the trapping of campy horror filmmaking. In some ways the story here many of the made-for-television films released in any given week, but don't judge the film based on its familiar plot. For its time (the film was released in 1965), it was a shocking story, rather than being a sensationalized account of kidnapping and fraud. The film builds slowly to a breaking point and like so many great thrillers, it is the sense of anticipation, rather than the immediate payoff, that makes Seance on a Wet Afternoon such a terrific and underrated film. Image Transfer Review: Released in a remastered 1.66:1 anamorphic widescreen transfer, it is likely that Seance on a Wet Afternoon looks better than it ever has on home video. Given the age of the film, I expected there to flaws and dirt, but there's also scratches, nicks and grain. Edge enhancement is a constant problem throughout hindering sharpness and detail. Audio Transfer Review: An English mono track is provided and as one might expect, it does not exactly blow the ceiling off of the house. Instead it is rather dull; the center channel seems to have been mixed rather poorly, resulting in numerous dropouts in the vital speaker. Oh well, the film is nearly forty years old, so we can cut it some slack, huh? Extras Review: No extra features are provided, save for a two-page insert about the history and production of the film. Finally getting a much needed release on DVD, Seance on a Wet Afternoon deserves a look from anyone with even a passing interest in stunning achievements in pacing and direction. The disc itself is not the deserving special edition that the film is screaming for, but who can complain when the disc is, at least, finally available.